After much photo opps, we headed to the starting line to wait for the gun start. 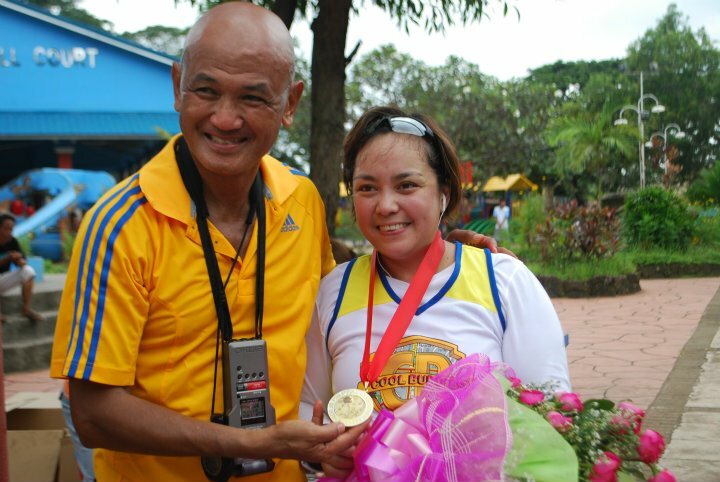 I bumped into Ultra hotness goodness Vicky Ras who I knew was gunning for a podium finish. I jokingly told her to stay in front so she can be with the “elites”. Our master plan was to follow a 3:1 Galloway program. I didn’t realize that there would be LOTS of hills (Argo, you said it was all downhill! Arrgh! LOL!) long the route so we changed it from 3:1 to 3:1 + walk break on uphills. Cool plan huh? Still in Tagaytay. Noy's updating his FB. 1. Being side swept – We are encouraged to run on the left side of the road, facing the incoming traffic. However, there are vehicles on the opposite lane who hastily overtake vehicles in front of them thereby driving right beside you with probably just inches in between. SCARY! 2. Running on uneven surfaces – Since running on the asphalted or cemented portion of the road is probably not the wisest thing to do (remember side sweeping buses/trucks? 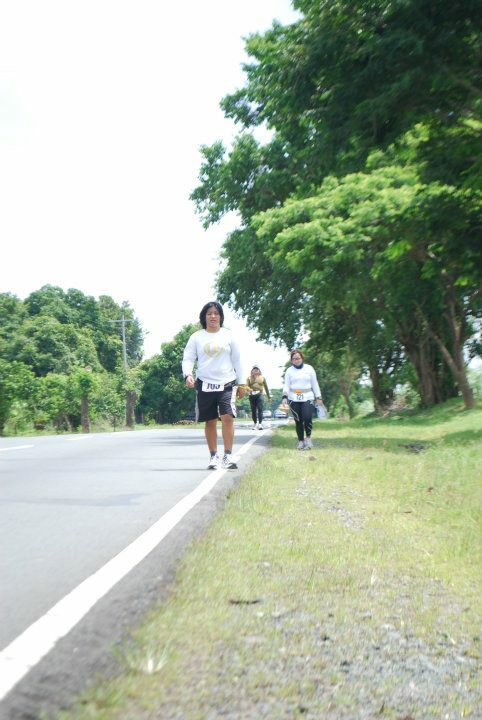 ), we had to run on the “shoulder” or “side walk” (if any) which is made of either dirt with rocks or gravel. I tripped probably more than a dozen times. Klutz! Am I the only one with the fear of getting side swept? 3. Horse and dog sh*t – A serious problem? Probably not. Ha! 4. Stray dogs – I AM SCARED OF STRAY DOGS. I kid you not. I had to wait for Noy to run right beside me so I wouldn’t have to deal with these dogs alone. He kept on saying “walk and look straight, don’t look at them, they can sense your fear” and he would laugh at the relief on my face overtime we’d safely pass a dog by. 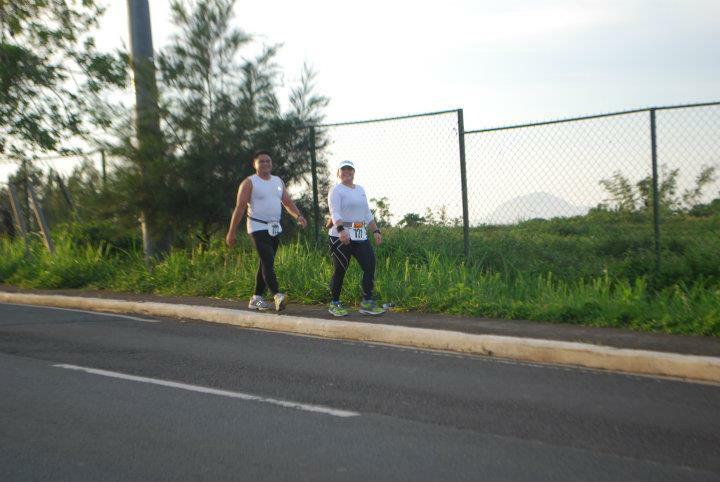 Unfortunately, hubby’s leg prevented him from running at a previous agreed pace so we took plenty of walk breaks. That and him updating his Facebook really slowed us down. My feet were starting to get blisters so I decided to change my shoes and socks. Big mistake! It made it worse so by the time we hot 30k, I had to change it back to my trusty Nike Lunar Glides. 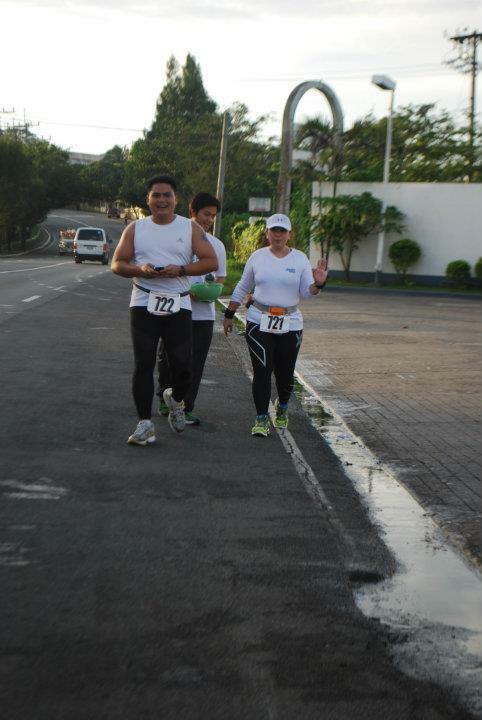 It was Noy, Ellen and I running/walking together now. I was starting to get impatient. 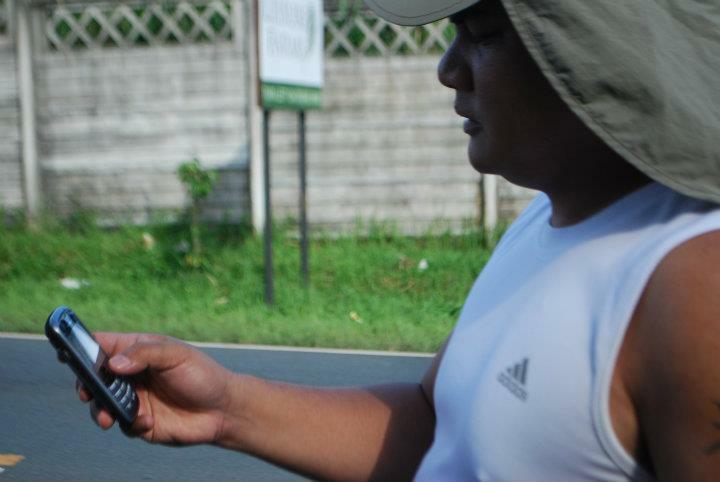 Whenever we’d pass our support vehicle, I’d tell Maridol to not allow Noy to stop. We had to pick up the pace. 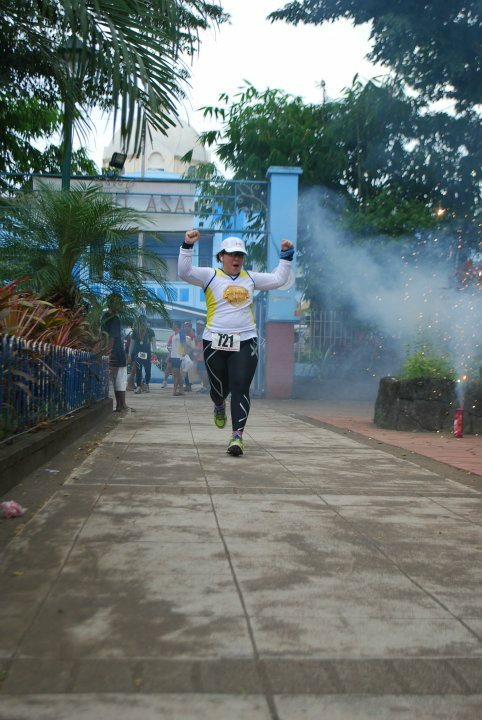 I know I envisioned crossing the finish line, hand-in-hand with the love of my life, but I knew that if I waited for him, I won’t make cut-off. So at 35k, I made a decision…Ellen and I went ahead. Noy got left behind. Love of my life or cut-off….CUT-OFF! LOL! Sorry my love! We struggled to hasten our pace. But pain due to my ITBS was so bad that I had to take pain killers. Celebrex is my friend. Last 2k Wilnar and Maridol said. 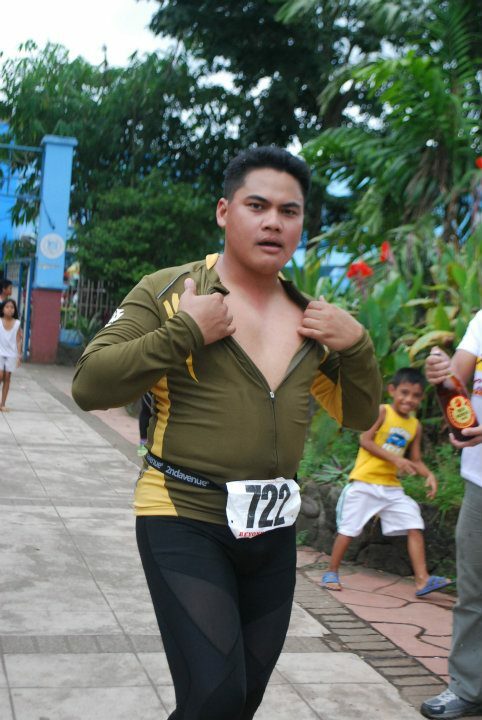 I handed Wilnar my hydration belt and took my Team DB singlet from Maridol. Two kilometers shouldn’t be too bad. I’ll be done in about 16mins or so. I thought to myself, yes…I can do this. 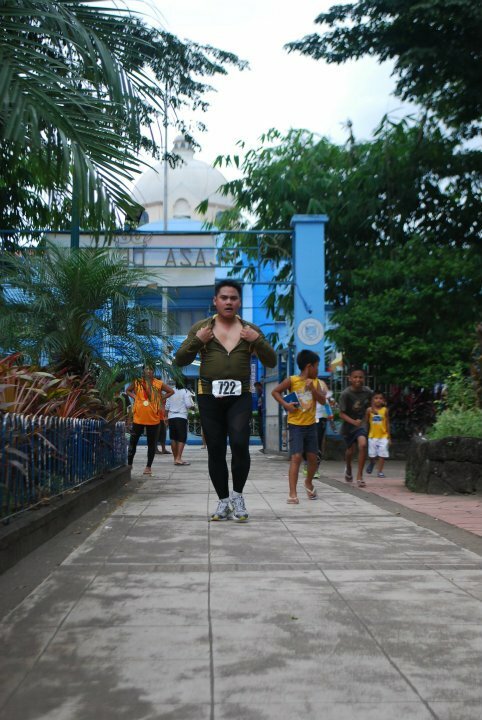 Last 1.5k. Freak! I can’t do this! Maridol quickly tell me that I only had 10 minutes before cut-off. I had to run fast to make it. Since we were already in town, weaving through passing tricycles, people and vehicles was not easy. I even had to cross the road alone. Thing is, I don’t know how to cross a street without the green and red man telling you when to stop and when to go. 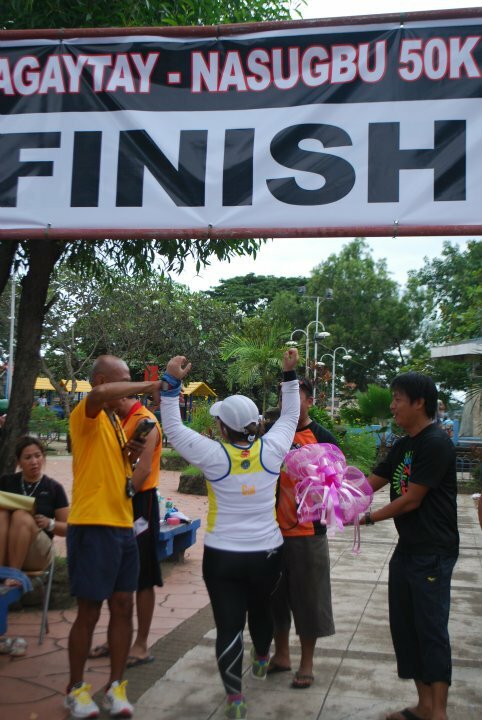 I quickly calmed my nerves and hurriedly crossed and made my way towards the finish area. 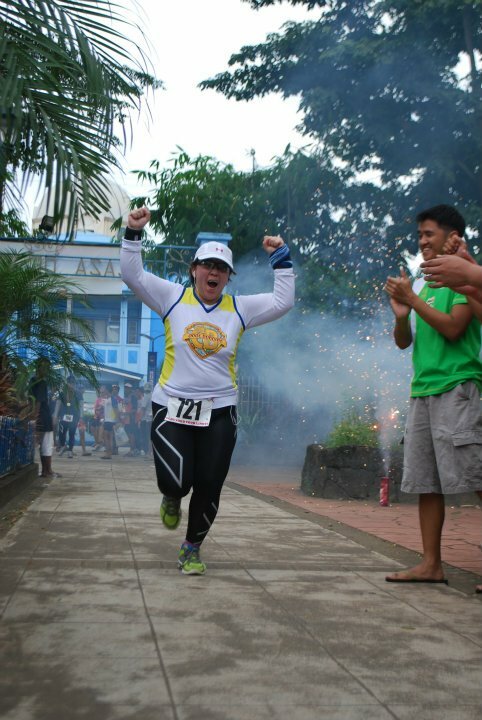 Seeing my friends by the finish line, cheering me on gave me another boost of adrenaline which allowed me to scream and sprint towards the finish line. I MADE IT!!! 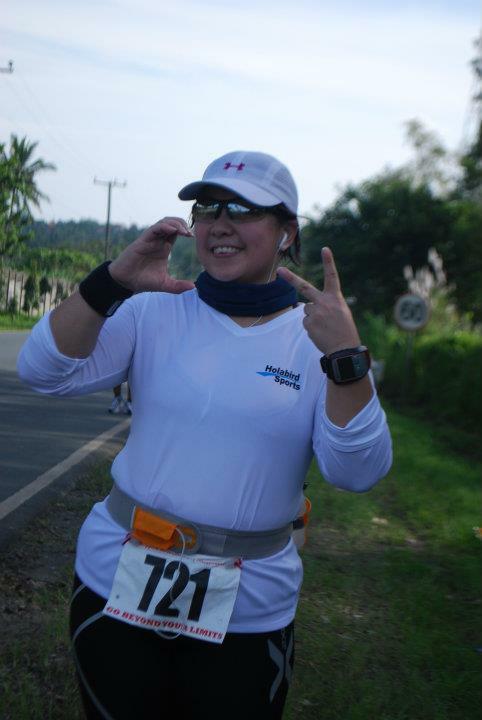 I finished my first ultramarathon and the best part is, I made the cut-off! 8 hours 59 minutes and some number of seconds. OMG! The joy!!! Marvin gave me a bouquet of flowers from my Team CB. 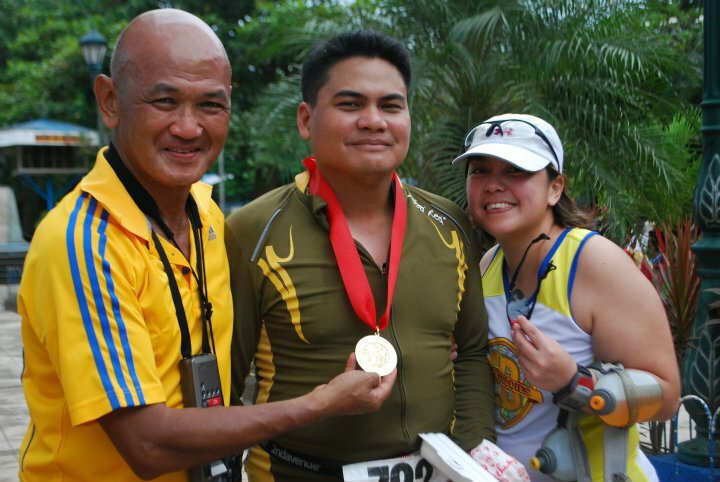 After I received my finishers medal from BR, I hugged my friends, said my thank you, ate my food, cheered Ellen on as she crossed the finish line and worryingly waited for Noy to arrive. Hubby crossed the finish line in 10 hours 15 minutes. I am proud of my dearest husband. He had major blister issues which prevented him from running. 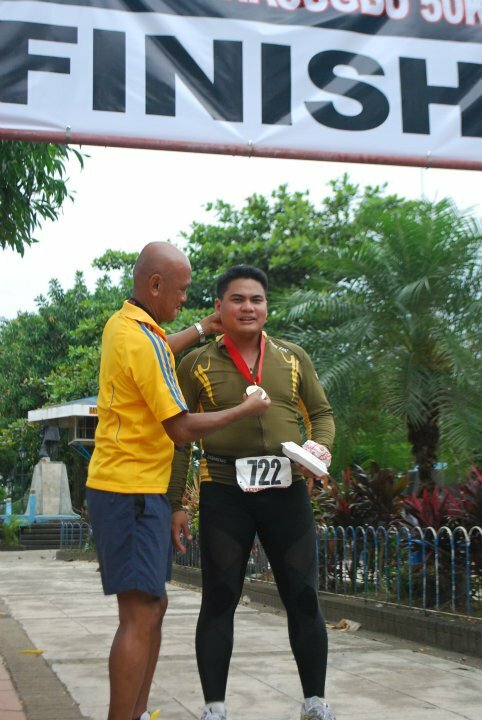 Seeing him finishing the race, all smiles, in good spirits, having the energy to crack a joke, brought tears to my eyes. 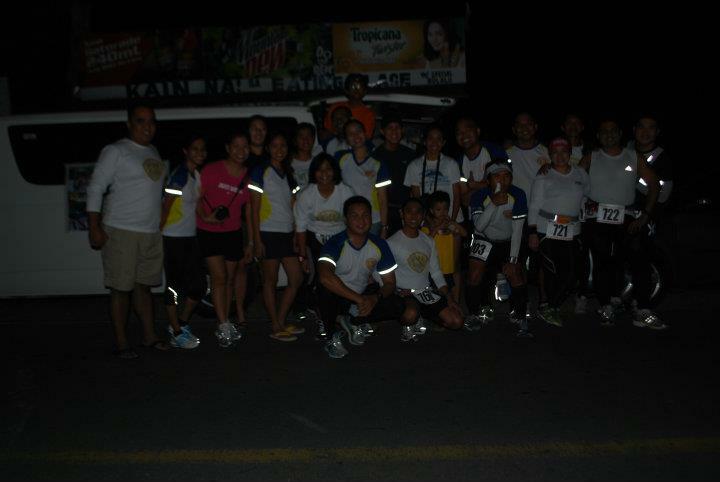 I want to thank our fabulous support crew…MARIDOL YABUT and WILNAR IGLESIA plus our driver BONG. You guys are the best! To my Team CB! Thank you for the support! I love you all!!! What’s next? To join a 5k race? :p Hahaha! Thanks Dhenz!!!! Gailey and Noy!!! Halika na let’s BDM!!! Congratulations you two!!! BDM?! *faints* hahaha! Maybe 2013….